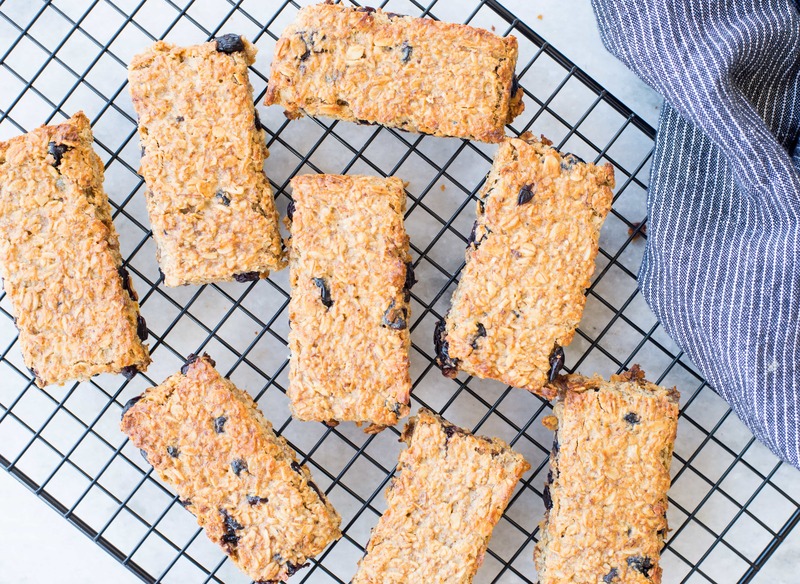 Healthy Blueberry Banana Granola bar is our new obsession at home. 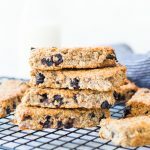 These soft and chewy homemade granola bars are gluten-free, vegan and refined sugar-free. These Blueberry Banana Granola Bars are the best granola bar ever. let me warn you, these are damn addictive too. As these are gluten-free, refined sugar-free, even if you eat an extra bar it is not going to hurt you. Making granola bar is far easier than you think. It is healthy because you know what goes into making these. Packaged granola bars even though labelled as healthy, has lots of unknown ingredients and hidden sugar. So beware when you indulge in store-bought granola bars. Homemade Granola Bar is incredibly easy and fuss-free. All you need is one bowl. 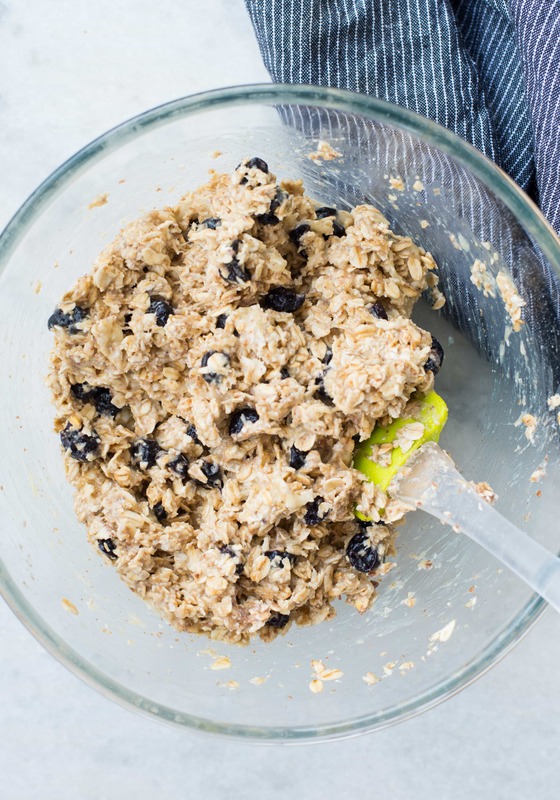 Mix everything in a bowl and bake it. 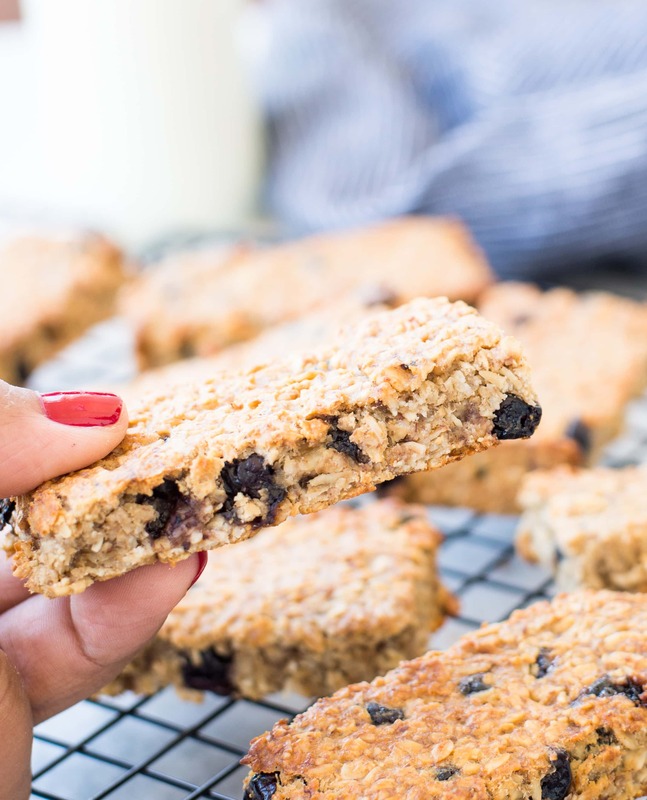 These granola bars are naturally gluten-free and refined sugar-free. Banana and blueberry give the required sweetness. Banana also acts as a binding agent for the bars. To keep this vegan I have used coconut oil and flaxseed meal. 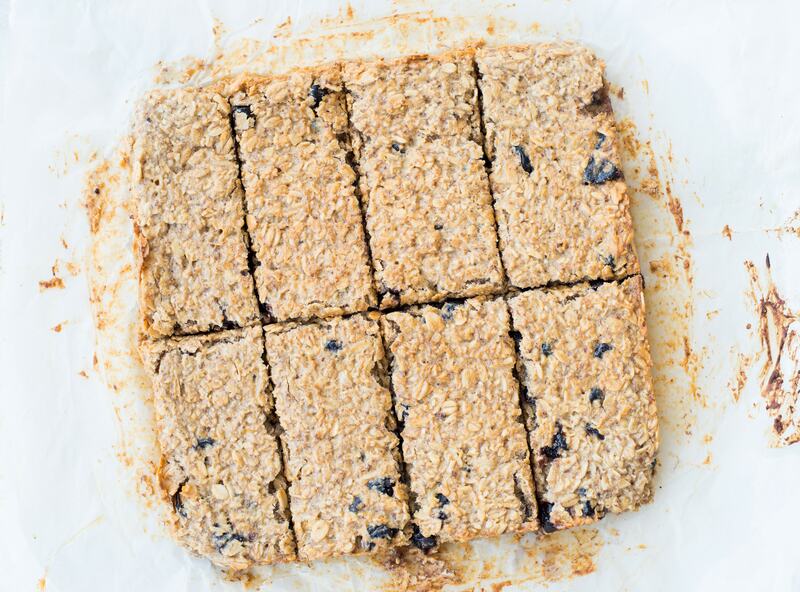 Peanut butter makes these healthy Granola bars protein rich. You can easily swap peanut butter with any other nut/seed butter of your choice. The homemade granola bar is pretty much customizable. You can add or subtract ingredients as per your preference. I have kept the flavours simple with banana and blueberry. You can include lots of other add-ons like nuts, chia seeds, pumpkin seeds, protein powder, chocolate chips, unsweetened coconut etc. You see, there is an endless number of possibilities. After a couple of failed attempts, I have learnt a few tips for making perfect granola bars. Granola bars need to be soft and chewy. 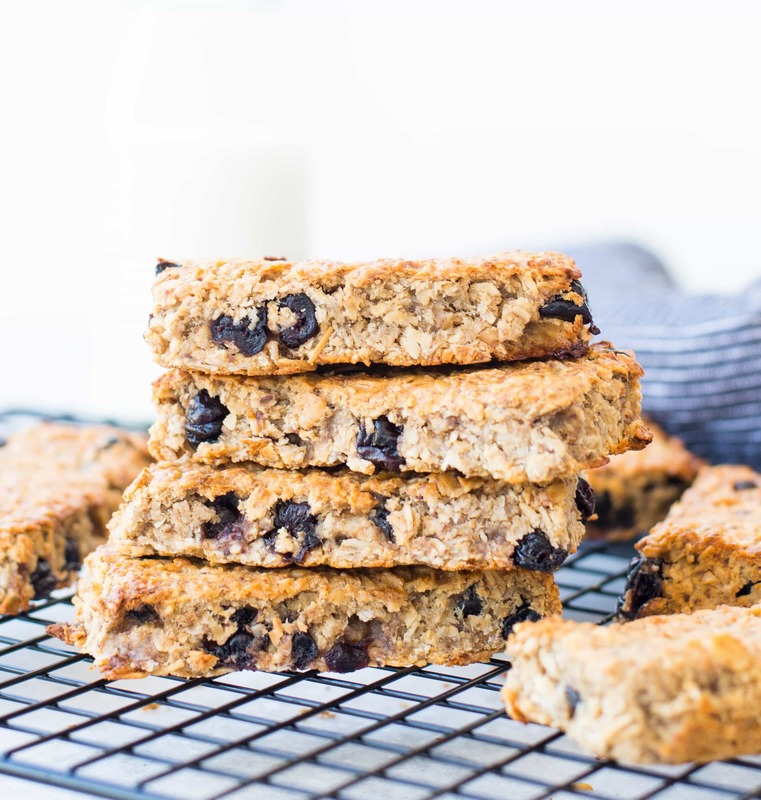 These Blueberry Banana Granola Bars are just perfect. One of the most common issue you might face while making granola bar is, they start to fall apart. The ingredients just don’t hold together. The last thing you would want is your granola bars turning into crumbles. I follow a simple trick to avoid crumbly granola bar is to pulse the Oats a couple of times in a food processor. Few broken pieces of oats help to hold the mixture together. Ingredients such as flax egg, pureed banana, coconut oil help with keeping the bar together. Another important step is to press the granola mixture evenly into the pan. Use your hand or back of a spatula to press the mixture into the pan. This step is optional but I like to toast the oatmeal before adding to the mixture. I like the nutty taste it gives. Don’t overbake the mixture. You might feel they are little undone while taking out of the oven. But once they come to room temperature it will have the perfect chewy centre. If you are ok to use egg then use a small egg instead of flax meal. These crunchy granola bars with wholesome ingredients are good for snacking too. Slip into your bag while going out and you don’t have to bother about those sudden hunger pangs. It will keep you full for a good amount of time. Sometimes I take this as my pre-workout meal as well. These bars stay well in the refrigerator up to 15 days(if they last that long 🙂 ). So make a big batch of it and store them. Mash ripe bananas with the back of a spoon until puree consistency. You will get roughly 1 cups of mashed banana. In a bowl take flax meal. Add warm water, mix well. Keep aside. The mixture will thicken while preparing other ingredients. Toast oats in the oven(@180 C) or in a skillet till light golden brown in colour. In a big mixing bowl add all the ingredients mentioned under wet ingredients. Mix everything well. In another bowl add all the dry ingredients and stir well. Add dry mixture to the wet mixture. Mix everything until well incorporated. Line a 8-inch square tin with parchment paper. Pour the mixture into the prepared tin. With the back of the spatula spread the mixture evenly and press into the pan. Bake for 20-25 minutes at 180 Celcius. Once baked, remove from the pan and place on a wired rack. When it is still little warm to touch, use a sharp knife and cut into bars/squares. Once the bars have completely cooled down, place in an airtight container.